Meditation with guided imagery, which often involves imagining yourself in a restful environment, may reduce your need for pain medication. Relaxation, meditation, positive thinking, and other mind-body techniques can help reduce your need for pain medication. Drugs are very good at getting rid of pain, but they often have unpleasant, and even serious, side effects when used for a long time. If you have backache, fibromyalgia, arthritis, or other chronic pain that interferes with your daily life, you may be looking for a way to relieve discomfort that doesn't involve drugs. Some age-old techniques—including meditation and yoga—as well as newer variations may help reduce your need for pain medication. Research suggests that because pain involves both the mind and the body, mind-body therapies may have the capacity to alleviate pain by changing the way you perceive it. How you feel pain is influenced by your genetic makeup, emotions, personality, and lifestyle. It's also influenced by past experience. If you've been in pain for a while, your brain may have rewired itself to perceive pain signals even after the signals aren't being sent anymore. The Benson-Henry Institute for Mind-Body Medicine at Harvard-affiliated Massachusetts General Hospital specializes in helping people learn techniques to alleviate stress, anxiety, and pain. Dr. Ellen Slawsby, an assistant clinical professor of psychiatry at Harvard Medical School who works with patients at the Benson-Henry Institute, suggests learning several techniques so that you can settle on the ones that work best for you. "I tend to think of these techniques as similar to flavors in an ice cream store. Depending on your mood,you might want a different flavor of ice cream—or a different technique," Dr. Slawsby says. "Practicing a combination of mind-body skills increases the effectiveness of pain relief." The following techniques can help you take your mind off the pain and may help to override established pain signals. 1. Deep breathing. It's central to all the techniques, so deep breathing is the one to learn first. Inhale deeply, hold for a few seconds, and exhale. To help you focus, you can use a word or phrase to guide you. For example, you may want to breathe in "peace" and breathe out "tension." There are also several apps for smartphones and tablets that use sound and images to help you maintain breathing rhythms. 2. Eliciting the relaxation response. An antidote to the stress response, which pumps up heart rate and puts the body's systems on high alert, the relaxation response turns down your body's reactions. 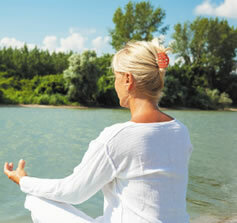 After closing your eyes and relaxing all your muscles, concentrate on deep breathing. When thoughts break through, say "refresh," and return to the breathing repetition. Continue doing this for 10 to 20 minutes. Afterward, sit quietly for a minute or two while your thoughts return. Then open your eyes and sit quietly for another minute. 3. Meditation with guided imagery. Begin deep breathing, paying attention to each breath. Then listen to calming music or imagine being in a restful environment. If you find your mind wandering, say "refresh," and call the image back into focus. 4. Mindfulness. Pick any activity you enjoy—reading poetry, walking in nature, gardening, or cooking—and become fully immersed in it. Notice every detail of what you are doing and how your senses and emotions are responding. Practice bringing mindfulness to all aspects of your life. 5. Yoga and tai chi. These mind-body exercises incorporate breath control, meditation, and movements to stretch and strengthen muscles. Videos and apps can help you get started. If you enroll in a yoga or tai chi class at a gym or health club, your health insurance may subsidize the cost. 6. Positive thinking. "When we're ill, we often tend to become fixated on what we aren't able to do. Retraining your focus on what you can do instead of what you can't will give you a more accurate view of yourself and the world at large," says Dr. Slawsby. She advises keeping a journal in which you list all the things you are thankful for each day. "We may have limitations, but that doesn't mean we aren't still whole human beings." Could your joint pain be bursitis? Questions & Answers: Are antidepressants safe during pregnancy?